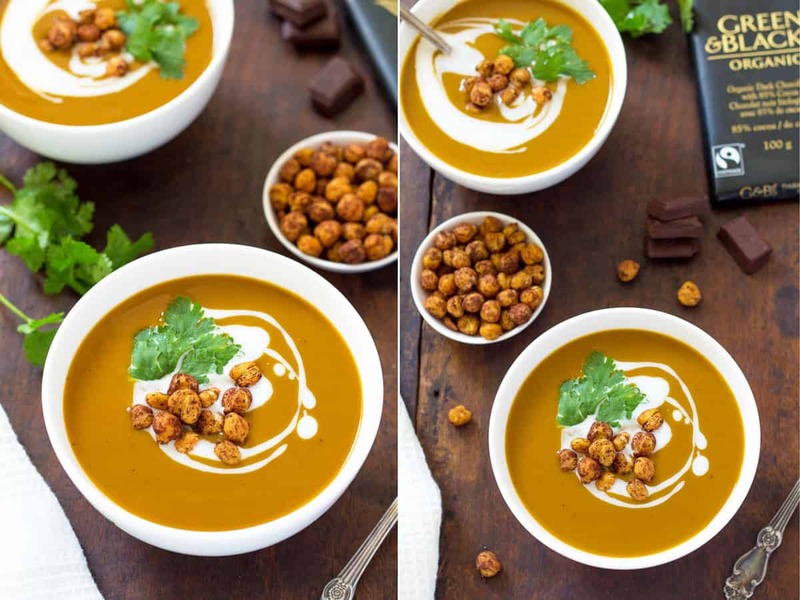 This velvety smooth Chocolate Roasted Butternut Squash Soup is topped with crunchy chili + cocoa roasted chickpeas. Thanks to the unique combination of dark chocolate, chili and spices this creamy soup has an aromatic mole-like richness, which makes it perfect both as an appetizer or main course. I am still very new to the concept of being a mom on Mother’s Day. This year will be only the second Mother’s Day since I became a mom to Olivia. Trust me, I have no expectations of my 22-months-old bringing me breakfast in bed. Although, she is fascinated with the fridge and happily brings out all the food items she likes to eat. After a couple of accidents, we had to move the eggs from their spot in the fridge door to another place out of Olivia’s reach. Since we are away from both of our moms this year, Mother’s Day will just be the 3 of us. We’ll most likely have breakfast at our favorite cafe. We love it, because it is within walking distance from us and serves delicious Western food (when we need a break from Vietnamese rice and noodles). But most importantly, they have a playground in the back that Olivia goes crazy about. It really is perfect! We can enjoy our meals and coffee while keeping an eye on her playing and running around to her heart’s content. Anyone who has tried to keep a toddler sit calm and quiet in a restaurant, will understand just how much we appreciate this setup. If you have the pleasure of preparing a meal for your mom, wife, or grandma on Mother’s Day, I have a perfect recipe for you. It is super easy to prepare in the blender but is rich & bold with complex flavors! I’ve teamed up with Green & Black’s Organic Chocolate to bring you Mother’s Day recipe inspiration. Last week there were these amazingly decadent German Chocolate Cake Pancakes, but chocolate is so versatile that we also wanted to give you an idea for savory uses. For this delicious soup, the butternut squash is roasted with a few pieces of Green & Black’s Organic 85% Chocolate, maple syrup, garlic, bay leaves and spices. Afterwards it gets blended with broth into a rich and creamy soup that has hints of Mexican mole sauce flavors. 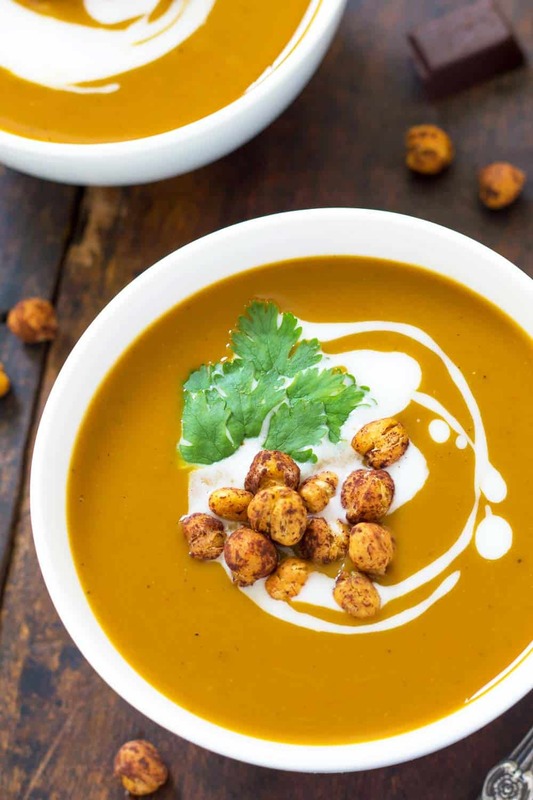 To contrast the creamy texture of the soup, chili + cocoa roasted chickpeas make a wonderfully crunchy topping. With a drizzle of coconut milk and cilantro leaves the soup is ready to serve. It makes a great savory brunch course, but can also be an appetizer or light dinner entrée. Whenever you chose to serve this Chocolate Roasted Butternut Squash Soup, I am certain your moms will love it! This is a clean eating and dairy free recipe that can also be made vegan, if using vegetable broth. 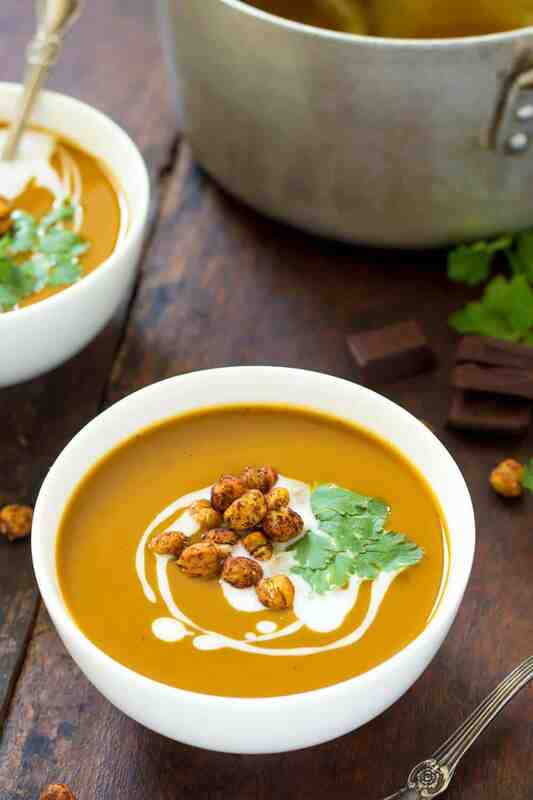 This velvety smooth chocolate roasted Butternut Squash Soup is topped with crunchy chili + cocoa roasted chickpeas. Thanks to the unique combination of dark chocolate, chili and spices this creamy soup has an aromatic mole-like richness, which makes it both perfect as an appetizer or main course. Preheat your oven to 400 degrees F. Line a baking sheet with parchment paper. Wipe the outside of the squash clean and cut it in half. Scoop out the seeds and place the squash halves on the baking sheet. Drizzle 1 tablespoon of olive oil all over the squash. Divide the Green & Black's Organic chocolate pieces, garlic cloves, bay leaves, maple syrup and spices (cinnamon, star anise, allspice, chili) into the squash cavities. Roast the squash until soft and tender, about 40-50 minutes. 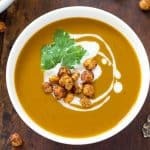 In the meantime you can prepare the Chili Cocoa Roasted Chickpeas: Rinse the canned chickpeas and dry them as much as you can between clean kitchen towels (or paper towel). Only remove the skins that come lose in the process. Toss the dried chickpeas with olive oil and salt, spread them on a small baking tray and roast for 20-30 minutes at 400 degrees F (you can roast them simultaneously with the squash). Shake the tray every 10 minutes to rotate the chickpeas. Once they have finished roasting* sprinkle with cocoa + chili and toss to coat. Set aside. Remove the roasted squash from the oven and let it cool enough until comfortable to handle. Heat remaining 1 tablespoon olive oil and cook the chopped onion until soft and translucent. Add to a blender. Pour the creamy butternut squash soup into a saucepan and heat to desired temperature. You can add some of the coconut milk while heating the soup, or drizzle it on top once filled into bowls for serving. Serve topped with cilantro and cocoa roasted chickpeas. * Don't let the chickpeas darken too much. They should be crispy on the outside, but will still have some chewiness in the center. Disclaimer: This post is sponsored by Green and Black’s Organic. All opinions are my own. Thank you for supporting the brands that help make Leelalicious possible. I really appreciate it. It looks so very creamy and tasty. Saving this for the pumpkin season. Yes! Thank you Angie. Here in Vietnam they seem to have butternut squashed year-round. How awesome is that? This sounds AMAZING! I love mole and butternut soup! 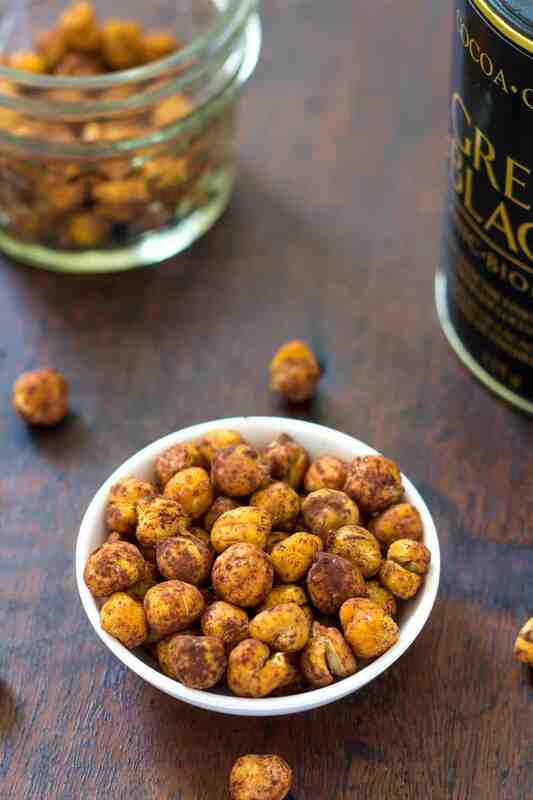 The spicy chocolately chick peas is sheer genius! Thanks for sharing! I’m definitely saving this one! Thanks Beth! This soup is a delicious flavor combo all around. What a great use of chocolate in a recipe. Can’t wait to try it myself! I have never had chocolate in a savory dish apart from the typical mole, which I didn’t like very much. I’d definitely be willing to try, though, because I love chocolate. It especially sounds delicious in this soup, as I love roasted butternut squash soup. 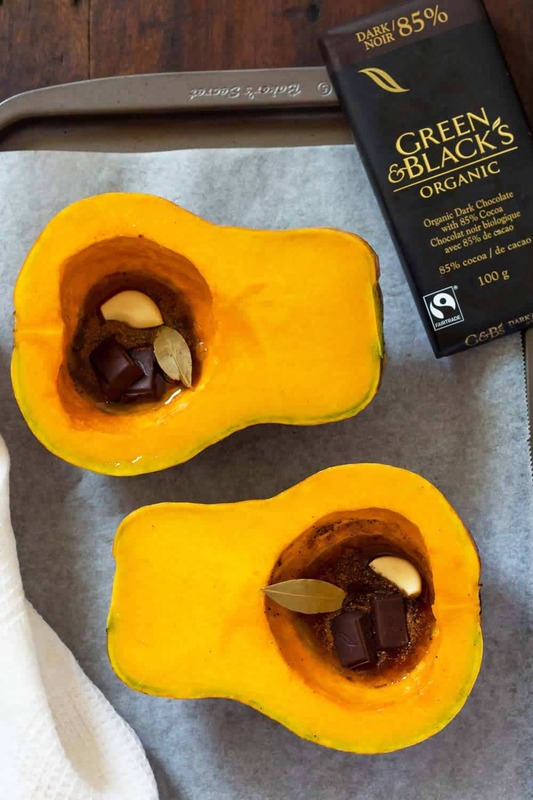 I love butternut squash but have never thought of combining it with chocolate! Quite unique and sounds delicious!! Hope you have a wonderful MOther’s day weekend! Thanks Naina. It’s a really delicious unique flavor pairing. Thank you Brandon. We had a wonderful Mother’s Day! Thank you Keith, the added chocolate really give this soup a unique edge, but totally yummy! O yes, yes, yes!! This is so fantastic! I want a bowl (or 2) right now!